Russian Hebrew author; born at Sadi, government of Kovno, 1848. Meisach has written and edited over one hundred works in Yiddish and Hebrew. He began his literary career in 1861 with the weekly "Ha-Karmel," since which year he has contributed to a great number of Hebrew and Yiddish periodicals, has edited the magazine "Gan Peraḥim" (i.-iii., Wilna-Warsaw, 1881-93), and has written various novels, essays, etc. Among these are the following: "Ha-Emunah we-Haskalah," essays (Wilna, 1874); "Miktabim mi-Sar shel Yam," essays (Warsaw, 1885-89); "Ṭefaḥ Megullah," criticisms (ib. 1886); "Bamat YiẓḥaḲ," on the theater (ib. 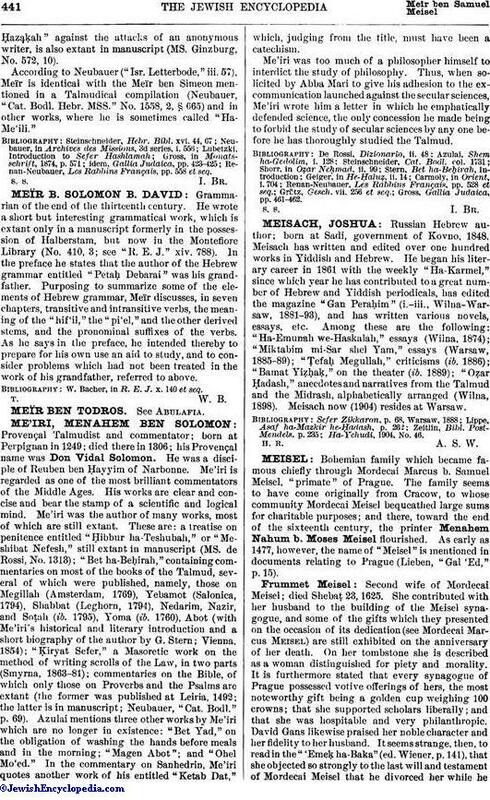 1889); "Oẓar Ḥadash," anecdotes and narratives from the Talmud and the Midrash, alphabetically arranged (Wilna, 1898). Meisach now (1904) resides at Warsaw.